Acknowledged author wrote FUNDAMENTALS OF INVESTMENTS 8 comprising 768 pages back in 2016. Textbook and etextbook are published under ISBN 1259720691 and 9781259720697. 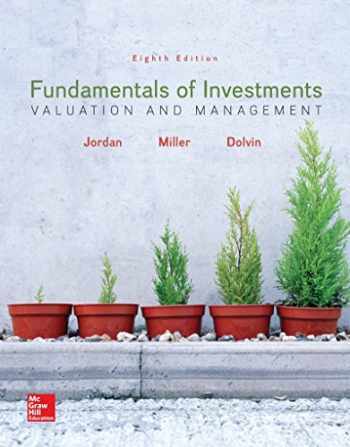 Since then FUNDAMENTALS OF INVESTMENTS 8 textbook received total rating of 4 stars and was available to sell back to BooksRun online for the top buyback price of $97.57 or rent at the marketplace. Fundamentals of Investments focuses on students as investment managers, giving them information to act on by placing theory and research in the proper context. The text offers a balanced, unified treatment of the four main types of financial investments―stocks, bonds, options, and futures. Topics are organized in a way that makes them easy to apply―whether to a portfolio simulation or to real life―and supported with hands-on activities. Then, resources within Connect help students solve financial problems and apply what they’ve learned. Jordan’s managerial perspective and superior pedagogy combine with a complete digital solution to help students achieve higher outcomes in the course.Connect is the only integrated learning system that empowers students by continuously adapting to deliver precisely what they need, when they need it, and how they need it, so that your class time is more engaging and effective.